What Reports are available at the account level? Account-level admins have access to 11 standard Sublime LMS reports. This lesson describes these standard reports, though other customized reports may be included for your institution. Click the Reports tab. Here you will see the default account-level reports available in Sublime LMS. Grade Export shows the student final grade results for all students in a given term. Last User Access shows the last login for active users. Outcome Results shows the learning outcome results for all students. This report also includes question banks. Provisioning will export all the needed information that relates to provisioning Sublime LMS. Recently Deleted Courses shows all the courses for a given term that have been deleted in the last 30 days. SIS Export will export all the needed files for Users, Accounts, Terms, Courses, Sections, Enrollments, Groups, Group Memberships, and Cross Listings. Student Competency shows the outcomes results for all students. 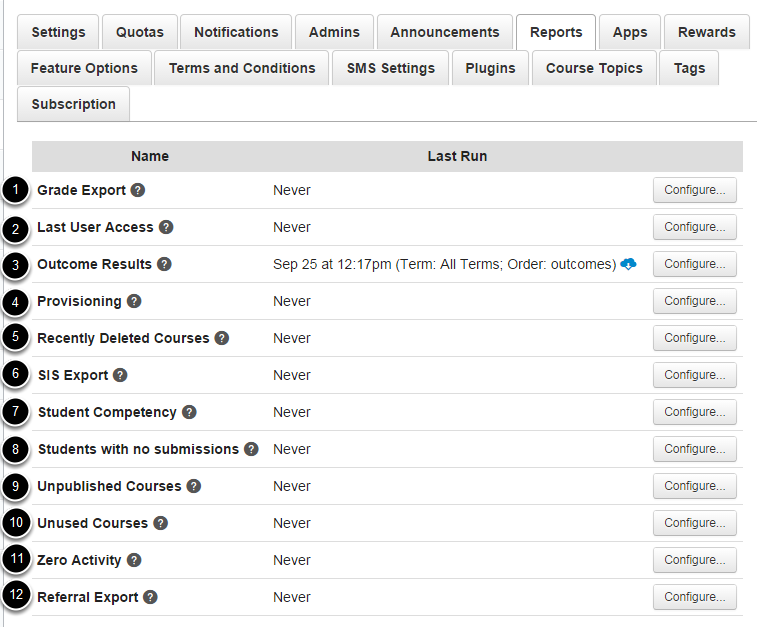 For detailed reports, create outcomes at the account or sub-account level and add those outcomes to course activities. Course level Outcomes are not included in the report. Students with no submissions shows all students enrolled in a course in a given term that have not submitted an assignment between the given date range in a course. Unpublished Courses shows all the courses for a given term that are not published. 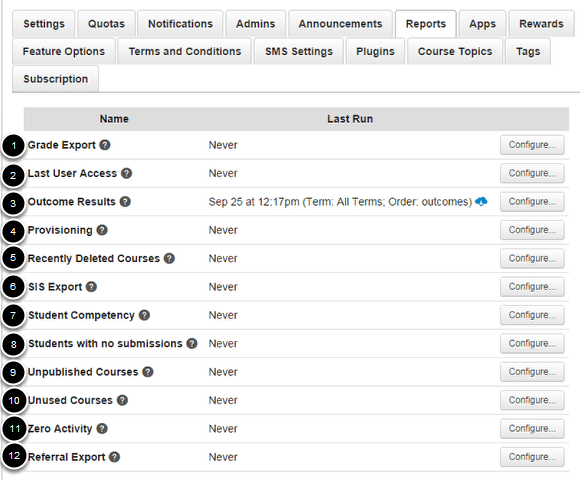 Unused Courses shows all courses that have none of the following items: assignments, announcements, discussions, files, modules, pages, or quizzes. Zero Activity shows all the students enrolled in any courses in a given term. Referral Export shows all the referral students in any courses. Note: By clicking the Question Mark icon next to the report name, you can view help information regarding that report. The Grade Export Report will show the final grade results for all the students in a term. The CSV file will have one row per enrollment and will show the current and final grade that is displayed in the course gradebook. You can choose between All Terms, Default Term, or any other term that is created . Courses with muted assignments may not accurately reflect scores in this report. To include deleted objects, check the Include Deleted Objects checkbox . Deleted objects may include deleted courses, users, or enrollments. Click the Run Report button  when you are done. Once you run the report, refresh your browser and click the download icon to view the report. The Last User Access report shows the last login for active users. The CSV file will have one row per enrollment and will show the date, time, and IP address where the user last accessed Sublime LMS. You can use the drop-down menu to choose between All Terms, Default Term, or any other term that is created. Courses with muted assignments may not accurately reflect scores in this report. Click the Run Report button when you are done choosing the term. The Outcome Results report shows the learning outcome results for all students. The resulting CSV file will have one row per user-outcome-result pair, and will show the details of the result including the associated assignment. Select the term of the report you want to run . You can use the drop-down menu to choose between All Terms, Default Term, or any other term that is created. Courses with muted assignments may not accurately reflect scores in this report. Select the radio button for the option according to how you want the report to be organized . You can order the report by users, courses, or outcomes. The Provisioning report will pull data from within Sublime LMS without using SIS information. For example, you can now pull a report that has a list of your unpublished courses vs. your published courses, as well as a report that shows all your cross-listed courses in Sublime LMS. Include Deleted Objects. Deleted objects may include deleted courses, users, or enrollments. Note: Term settings only impact Courses, Sections, Enrollments, and Cross-listing. 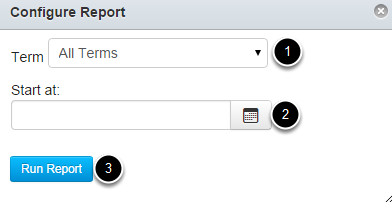 Click the Run Report button when you are done choosing the options for the report. The Recently Deleted Courses report report shows all the courses for a given term that have been deleted in the last 30 days. The resulting CSV file will have one row per course and will show the course id, course sis id, course short name, course name, course start and end dates. You can use the drop-down menu to choose between All Terms, Default Term, or any other term that is created. Courses with muted assignments may not accurately reflect scores in this report. Click the Run Report button when you are done choosing the term. The SIS Export will export the needed files for Users, Accounts, Terms, Courses, Sections, Enrollments, Groups, Group Memberships, and Cross Listings for an SIS import. The Student Competency report shows the outcomes for all students. 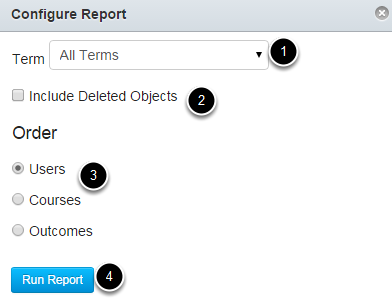 For detailed reports, create outcomes at the account or sub-account level and add those outcomes to course activities. Course-level outcomes and outcomes tied to question banks are not included in this report. You can use the drop-down menu to choose between All Terms, Default Term, or any other term that is created . Courses with muted assignments may not accurately reflect scores in this report. The Students with no submissions report shows all students enrolled in a course in a given term who have not submitted an assignment between the given date range in a course. This report contains one row per student enrollment that meet the criteria. Choose a start date  and an end date  for the report by clicking on the calendar icons. 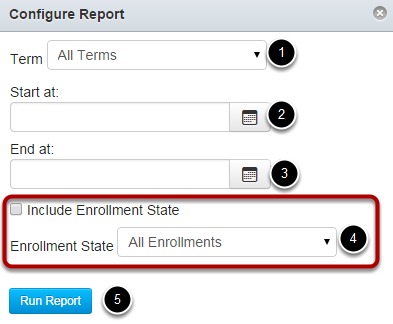 You may also choose to include the enrollment state in the report by clicking the Include Enrollment State checkbox and selecting an option from the drop-down menu . 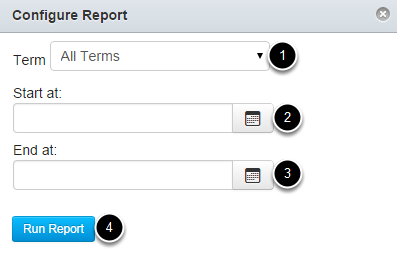 Click the Run Report button  when you are done choosing the options for the report. The Unpublished Courses report shows all the courses for a given term that are not published. The resulting CSV file will have one row per course and will show the course id, course sis id, course short name, course name, course start and end dates. The Unused Courses report shows courses that have none of the following items: assignments, announcements, discussions, files, modules, pages, or quizzes. The Zero Activity report shows all the students enrolled in any courses in a given term. 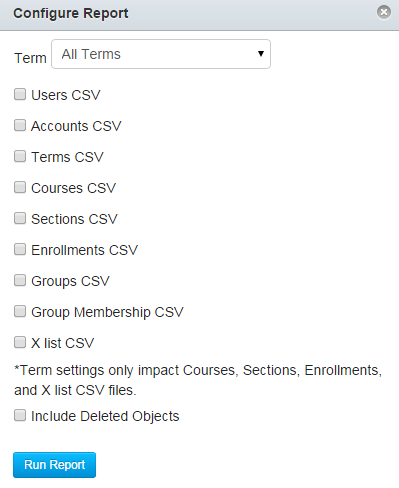 Resulting CSV file will have one row per user enrollment that have not visited the course since the date. Select a term from the drop-down menu . You can choose between All Terms, Default Term, or any other term that is created. Courses with muted assignments may not accurately reflect scores in this report. Choose a start date  for the report by clicking on the calendar icon. Referral Export report shows all the Referral students enrolled in any courses. 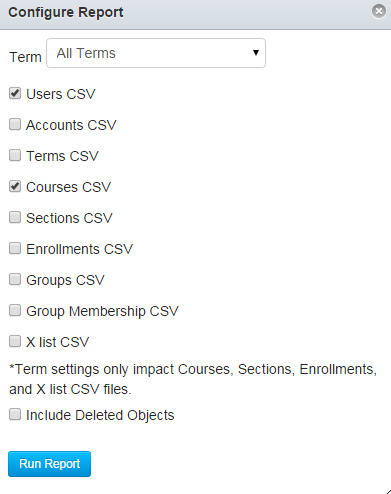 Resulting CSV file will have one row per user enrollment that have not visited the course since the date.